The unemployment rate in Europe (EMU) continues to fall. Germany has just seen another post-reunification low in its rate of unemployment as its rate fell to 3.6% in December from 3.7% in November. For all of the EMU, the unemployment rate is unchanged at 8.7% in December after falling in November. Germany continues to have the lowest unemployment rate in the EMU and the lowest relative to its own history in the table that features the earliest EMU members. For the eleven countries in the top panel of the table, five saw unemployment rate drops in December, seven saw drops in November and seven saw drops in October. Over three months and six months, ten of eleven countries experienced drops in their unemployment rates; Finland was the exception. Over 12 months, nine countries in the top panel of the table experienced drops in their unemployment rates with Finland and the Netherlands as exceptions. 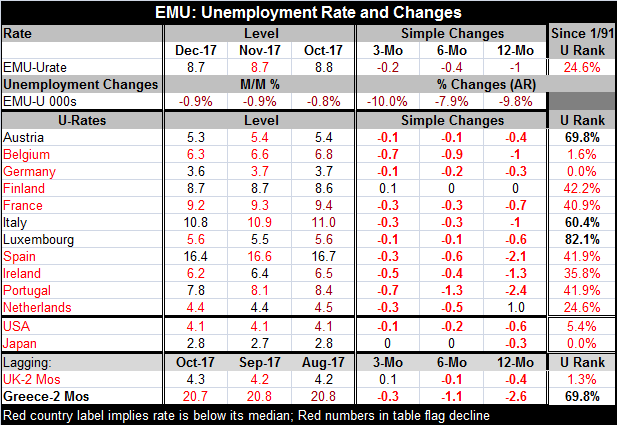 For all of the EMU, the union-wide unemployment rate has fallen by one percentage point; that has slowed to a drop of 0.4 percentage points over the last six months. Only Belgium, Germany, Portugal and the Netherlands are experiencing a faster drop in their respective rates of unemployment over six months than they do over 12 months. The EMU as a whole has an unemployment rate that has been lower historically only about 25% of the time. However, only three of the eleven countries in the top panel of the table (original EMU members) have unemployment rates that have been lower less than 25% of the time! Those members are Germany, Belgium and the Netherlands (just barely). Still, there has been broad-based progress: all but three countries have unemployment rate rates below their respective historic medians (Austria, Italy and Luxembourg) and all but four have unemployment rates below their respective historic averages (Spain, Luxembourg, Italy and Austria). There have always been substantial differences among the unemployment rates of the original EMU members. But the standard deviation among member rates of unemployment currently is about 6% below its average since 1994. And while dispersion did decline again in December, the rate of descent has slowed markedly. This means that there is some degree of increase in harmonization across the EMU which is good news for the European Central Bank which can only make one monetary policy. But the trend to 'increased harmonization' is slowing. And another trend shows that the unemployment rate in the EMU and the rates across nearly all the original members are still falling. Still, large differences in domestic rates of unemployment remain. The global outlook is improving but not all hearts and roses. In overnight news, the U.K. saw car production fall for the first time in eight years. China's manufacturing PMI took a step back. A new poll on oil prices now expects that we have seen the high in oil for the year ahead. If that is correct, there will be no push to inflation from oil for the rest of the year. And if oil backs off, there may even be more depressing news for prices from oil. Central banks generally still are not meeting their price objectives. Europe is in a different situation than the U.S. In Europe, there is still a lot of slack in the economy. The U.S. is in more or less the same situation as Germany; but even there in the U.S. case shows that much of the decline in the unemployment rate is because workers have left the job market and are no longer counted as either working or not working. There is still very little pressure on wages - anywhere- given the state of the labor markets. Given the ongoing intense role of international competition and technology, wages seem to still be under constraints. It is not clear if ongoing declines in the unemployment rate in Western economics will be enough to expedite wage increases there.